The land use/management changes advocated through SCaMP are just the latest in a long series of anthropogenic changes in the Hodder catchment. The most significant changes occurred as part of post-War practices to increase agricultural output. As over many areas of Pennine moorland, gripping was undertaken in the Hodder catchment during the post war years, a time when government grants were available for upland drainage. Grips typically consist of narrow open surface drains of approximately 1m in depth, which may be oriented acutely or perpendicular to hillslope contours. They increase the rate of drainage from upland soils; which was historically viewed as beneficial for ‘improving’ land for game rearing and pasture development. 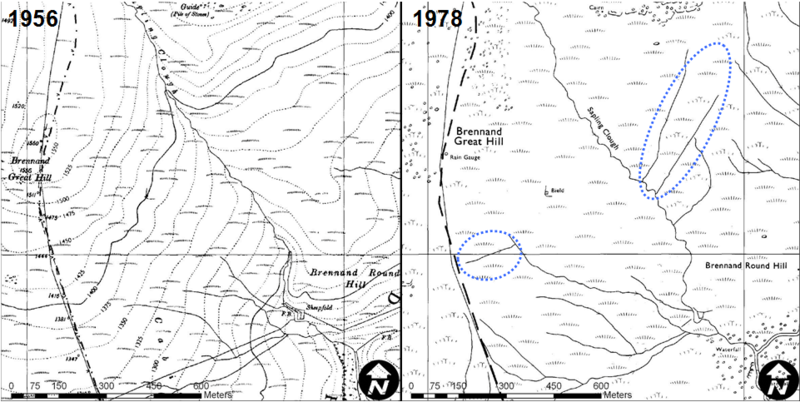 Historical Ordnance Survey (OS) maps indicate that the upland drainage network increased considerably during the 1950s and 1960s. Whilst this could be due to better mapping, the extended network features are mostly strongly linear and are often labelled as drains, providing some reassurance that they are man-made. Many of the features have been confirmed as grips through detailed ground surveys, but even more convincing evidence comes from aerial photographs. Public archive aerial photographs show that distinctive ‘herring bone’ land drainage patterns appear between the 1940s and 1960s, as shown in the images below. 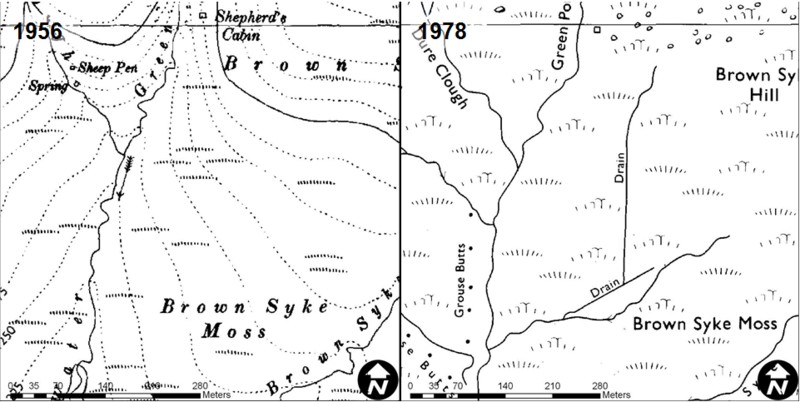 Based on reviews of OS map and aerial photography changes over time, as well as detailed ground surveys performed by Dinsdale Moorland Associates on behalf of United Utilities, it has been estimated that at least a 50km length of new grips were dug in the Bowland Fells between 1956 and 1959. The table below gives a breakdown per sub-catchment. A significant number of sheep are grazed on the fells, and stocking densities have generally increased over time. Sheep can have an impact on peat; over grazing can cause areas of bare peat to develop and/or prevent their recolonisation by vegetation, leaving them vulnerable to erosion. 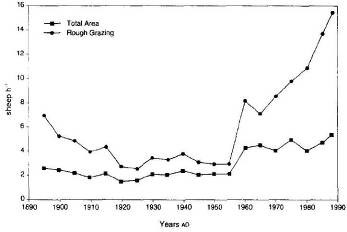 Mackay and Tallis (1996) investigated how both agricultural practices and vegetation cover changed within the Bleasdale Parish in the Langden Brook catchment over the period 1895–1988. Their analysis drew on parish agricultural records, rainfall records, peat accumulation rates, evidence of atmospheric pollution, peat core pollen data and macrofossil records. The study revealed that a catastrophic upland burn occurred in 1921, this being the combined result of dry conditions on the moors following an extended period of below average rainfall in the early 1900s culminating with an exceptional drought in 1921, coupled with ceclining management standards due to gamekeeper shortages after the First World War. Bare areas have not been able to recolonise due to sheep numbers. The study found that total sheep numbers rose steadily over the period 1895–1970 from approximately 5,000 to 8,000, and then increased dramatically to 15,000 in 1988. Current upland agri-environment initiatives in the SCaMP area aim to reverse the deterioration of the peatland. An area in Bottoms Beck, upstream of Stocks Reservoir, known as Gisburn Forest (the largest forest in Lancashire at 12.2km2 in area). A large predominantly coniferous woodland on the northern slopes of Longridge Fell in the south of the catchment. In Dunsop Valley, the dominant species are Sitka spruce, Norwegian spruce and larch, whilst Sitka spruce is the predominate species Gisburn Forest, being suited to its gleyed soils and exposed location. Forestry Felling Plans are in place in these woodland, which involves felling spruce and replanting with native species (e.g. birch, oak, ash, alder and hazel). The Forestry Commissions Felling Plan for the Dunsop Valley details how the felling and replanting processed is managed in this area. As shown in the figure below, the plantation has been divided into six sub-areas. The sub-areas are to be/have been felled on a five year rotation and replanted. According to forest management guidelines, remnant branches are placed on the extraction routes during forest clearance to minimise erosion and soil compaction. To date nearly 100ha of Dunsop Valley Forest have been felled and replanted in this way. Felling in Gisburn follows a five-year plan similar to Dunsop valley, but the felling regime is planned to be gradual and for isolated smaller patches (i.e. there will be no large, contiguous areas felled). Long-term changes in channel morphology have been identified in the region. Through the assessment and dating of terrace sequences in the upper Hodder and Langden Brook, Harvey and Renwick (1987) suggest human-induced land use changes may have affected sediment supply. In particular woodland clearing and agricultural expansion around 900 years ago led to erosion and increased channel migration. Flood events can also impact strongly on channel morphology, often causing gullies to be formed on upland slopes. However increased anthropogenic pressure on upland hillslopes over the last 500 years is thought to have increased the vulnerability of the Hodder system to this process (Chiverrell et al. 2007). Newson and Bathurst (1990) documented the impact of the 1967 major flood on erosion in the Dunsop catchment and the resulting siltation of the water supply infrastructure. Similar impacts in the Loud valley were reported by Weld (1851). The Hodder is not extensively channelised (e.g. for the purposes of flood protection), however there are some localised flood defences near the outlet of the River Loud and at Slaidburn (Environment Agency 2006) and some minor modifications associated with the water intake structures in the headwater areas dating to the 1880s to 1930s. More recently The Ribble Catchment Conservation Trust (Fisheries) has carried out channel modifications on Langden Brook, working with United Utilities to return the channel to a more braided state.